Got to meet up with Jalna, Mich and her son for lunch on Friday. Jalna's pizza was 1/2 pesto and 1/2 herb olive oil sauce, mozzarella/parmesan cheese, artichoke hearts, bacon, spinach, spicy chicken sausage and garlic toppings...total garlic breath afterwards, but super delicious! I chose the Hawaii Pie-O : original crust, zesty sriracha red sauce, mozzarella, salami, char siu, portuguese sausage, pepperoni, topped with fresh cilantro and cilantro aioli. This was good too! Not overly spicy. 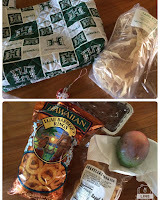 Jalna was so nice to share with me a bag of Taro Ko chips, homemade UH bag (nice!) and also a Hello Kitty charm! Mich shared some Regal Foods' cornflake cookies, homemade mango bread (so good! ), some BBQ chips and a mango from her tree! It was so nice to meet Mich's son and also to catch up with Jalna and Mich. Thanks Mich for treating us to lunch! I'll buy lunch next time! N, she didn't "seize up"...lol. Jalna & Mich are super kind! Kat, that was so good fun catching up. I hope I remember everything you said and don't ask you the same questions next year. I'll tell Mich to kick me under the table if I do. And BTW, howdahell did you remember all the items in my pizza anyway? The FBI and CIA totally missed the boat, man. N, I did pressure out little bit, but maybe Kat didn't notice. I couldn't decide on my 4th and 5th items and was going, "Um um um um . . . " LOL. Mich, I think it has yakiniku meat in it, that's why it's so ono!! It's the one CQ's parents brought back from Japan a few months ago. You shoulda seen Landon's face light up when he saw the package again. Yum, the pizza looks great! it was really good K!